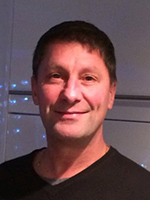 Dale started his working career as an engineering apprentice in 1978 at a Crankshaft Manufacturer in Sheffield, spending 13 years as a machinist. He then moved into junior management at 29 and on from there to sales and commercial roles with other companies. A young at heart fitness fanatic, Dale has played football, rugby, squash and golf since childhood and now loves golf so much that you will find him most weekends, whatever the weather on a golf course. He’s a member at Sitwell Golf Club in Rotherham of which Breitenfeld sponsor the league team. He also loves playing golf in Turkey where Dale believes you will find some of the best courses in the world. However, Dale’s latest fad is boxing! He trains with a personal trainer who sparred with the likes of Jonny Nelson, Ryan Rhodes and many more from the Ingles camp. This training takes up 4 nights a week, with sessions lasting between 2 & 3 hours - a long time to spend getting beat up every night!!! Joking apart, Dale loves boxing and has had the privilege to meet some special legends such as Sugar Ray Leonard, Ricky Hatton & Nigel Benn at charity events, and had his photo taken with them all, framed pictures he treasures.